Two of nation's oldest retailers set $11B merger. Will lower prices, better merchandise follow? NEW YORK (CNN/Money) - Kmart is buying Sears, Roebuck & Co. for $11 billion in a deal that will marry two of the nation's oldest retailers that had trouble keeping up with the changes in American culture around them. What do you expect from the Kmart-Sears merger? The deal, announced Wednesday morning, will create the third-largest retailer in the country. The new company, known as Sears Holdings, will be based at Sears headquarters outside Chicago. While the new company will operate both Sears and Kmart stores, "several hundred" Kmarts will be converted to Sears, Sears Chairman Alan Lacy said at a news conference. The companies currently operate about 3,500 stores combined. "Sears has had a very different problem from Kmart," Lacy said. "Our service and products are as good as our competitors but they're not where our customers are. This now gives us the opportunity to grow off-mall locations closer to the customer." Kmart, founded as S.S. Kresge in Detroit in 1899, has long been strong in clothing and home accessories, and in recent years has added brands such as Thalia Sodi, Jaclyn Smith, Joe Boxer and Martha Stewart Everyday products. Sears, which started selling watches through catalogs in 1886, later became best known for its Craftsman tools and Kenmore appliances. And while it's struggled in clothing and other soft lines, it bought Lands' End and developed youth-oriented Apostrophe brand to try to fill those holes. For consumers, the deal means being able to get appliances and other hard goods at Kmart and more clothing at Sears -- and could mean lower prices as the two chains try to compete. "Imagine going into Kmart and buying a Sears Craftsman tool set, or buying Kmart's Martha Stewart home products at Sears," said Marshal Cohen, chief retail analyst with market research firm NPD Group. "To Kmart shoppers, Lands' End may not mean anything, but now it will." "We don't want two separate cultures but to blend it into one great culture." Kmart Chairman Edward Lampert said Thursday. "The idea is to make the stores more competitive while staying focused on the customer." From meager beginnings, Kmart and Sears both grew quickly to dominate the retail landscape after World War II. Then along came Wal-Mart and other big discounters like Target, newer chains that changed the face of retailing in America. Andy Serwer takes a closer look at the $11 billion merger of two American retail icons. Ali Velshi reports on what the deal means for investors. "It's not so much that Sears and Kmart did anything wrong, it's just that they didn't change while the rest of the industry was changing around them," said Barbara Kahn, professor of marketing at the Wharton School. 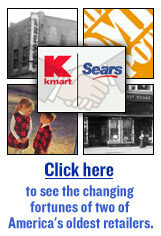 "Sears and Kmart did not differentiate themselves from the competition. Wal-Mart came along with its great service and low-prices, other retailers started to innovate more with products and service. Sears and Kmart simply trudged along and thought that was good enough," she said. Retail analyst Kurt Barnard said Kmart's low prices and Sears reputation for service should make a good fit. But he and other analysts said the combined company will still face stiff competition, and that store closings were likely. "One [name] will probably fade out of existence," Barnard said, adding, "Don't be so sure that Sears is the one that survives. Kmart is a discount store name and perhaps more able to compete with Wal-Mart on that basis than Sears." The merger should help the new company compete against Wal-Mart (Research), the world's largest retailer, as well as Home Depot (Research), the home improvement chain, and Target (Research), which will lose its place as No. 3 to the combined Sears-Kmart. Sears has been too slow to expand away from mall locations, industry analysts said. "If there are indeed hundreds of Kmart conversions into Sears, the company will dramatically accelerate its off-mall presence, a category which has been its downfall," said Lois Huff, retail analyst with Retail Forward. Sears opened a new store concept, Sears Grand, last year in a bid to battle back against Wal-Mart, Target and Best Buy, which have moved rapidly into free-standing stores in cities and suburbia. "The benefits to Sears consumers is more product choice and shopping convenience. Kmart's apparel brands like Joe Boxer and Thalia Sodi have lower starting price points, so consumers could see some downward movement in prices in the apparel category." said Huff. "The Kmart stores that continue to exist will be the ones that Sears passed on," she said, adding, "If the company keeps them, they could be converted into value stores in the same category as Dollar General." Industry consultant George Whalin went a step further, saying the merger could signal the end of the Kmart name. "This is more a real estate deal than anything else. I would be very surprised if Kmart doesn't completely go away in the two to three years, or become something completely different," he said.